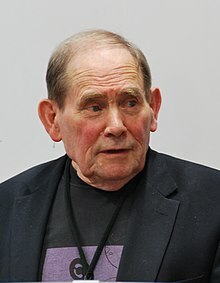 Sydney Brenner CH FRS FMedSci MAE (13 January 1927 – 5 April 2019) was a South African biologist. In 2002, he shared the Nobel Prize in Physiology or Medicine with H. Robert Horvitz and Sir John E. Sulston. Brenner made significant contributions to work on the genetic code, and other areas of molecular biology while working in the Medical Research Council (MRC) Laboratory of Molecular Biology in Cambridge, England. He established the roundworm Caenorhabditis elegans as a model organism for the investigation of developmental biology, and founded the Molecular Sciences Institute in Berkeley, California, United States. Brenner was born in the town of Germiston in the then Transvaal (today in Gauteng), South Africa, on 13 January 1927. His parents, Leah (née Blecher) and Morris Brenner, were Jewish immigrants. His father, a cobbler, came to South Africa from Lithuania in 1910, and his mother from Riga, Latvia, in 1922. He had one sibling, a sister, Phyllis. He was educated at Germiston High School and the University of the Witwatersrand. Having joined university at the age of 15, it was noted during his second year that he would be too young to qualify for the practice of medicine at the conclusion of his six-year medical course, and he was therefore allowed to complete a Bachelor of Science degree in Anatomy and Physiology. He stayed on for two more years doing an Honours degree and then an MSc degree, supporting himself by working part-time as a laboratory technician. During this time he was taught by Joel Mandelstam, Raymond Dart and Robert Broom. His master thesis was in the field of cytogenetics. In 1951 he received the Bachelor of Medicine, Bachelor of Surgery (MBBCh) degree. Brenner received an 1851 Exhibition Scholarship from the Royal Commission for the Exhibition of 1851 which enabled him to complete a Doctor of Philosophy (DPhil) degree at the University of Oxford as a postgraduate student of Exeter College, Oxford, supervised by Cyril Hinshelwood. Following his DPhil, Brenner did postdoctoral research at the University of California, Berkeley. He spent the next 20 years at the Laboratory of Molecular Biology in Cambridge. There, during the 1960s, he contributed to molecular biology, then an emerging field. In 1976 he joined the Salk Institute in California. Together with Jack Dunitz, Dorothy Hodgkin, Leslie Orgel, and Beryl M. Oughton, he was one of the first people in April 1953 to see the model of the structure of DNA, constructed by Francis Crick and James Watson; at the time he and the other scientists were working at the University of Oxford's Chemistry Department. All were impressed by the new DNA model, especially Brenner who subsequently worked with Crick in the Cavendish Laboratory at the University of Cambridge and the newly opened Medical Research Council (MRC) Laboratory of Molecular Biology (LMB). According to the late Beryl Oughton, later Rimmer, they all travelled together in two cars once Dorothy Hodgkin announced to them that they were off to Cambridge to see the model of the structure of DNA. Brenner made several seminal contributions to the emerging field of molecular biology in the 1960s (see Phage group). The first was to prove that all overlapping genetic coding sequences were impossible. This insight separated the coding function from structural constraints as proposed in a clever code by George Gamow. This led Francis Crick to propose the concept of the adaptor or as it is now known "transfer RNA (tRNA)". The physical separation between the anticodon and the amino acid on a tRNA is the basis for the unidirectional flow of information in coded biological systems. This is commonly known as the central dogma of molecular biology i.e. that information flows from nucleic acid to protein and never from protein to nucleic acid. Following this adaptor insight, Brenner proposed the concept of a messenger RNA, based on correctly interpreting the work of Elliot "Ken" Volkin and Larry Astrachan. Then, with Francis Crick, Leslie Barnett and Richard J. Watts-Tobin, Brenner genetically demonstrated the triplet nature of the code of protein translation through the Crick, Brenner, Barnett, Watts-Tobin et al. experiment of 1961, which discovered frameshift mutations. This insight provided early elucidation of the nature of the genetic code. Leslie Barnett helped set up Sydney Brenner's laboratory in Singapore, many years later. Brenner, with George Pieczenik, created the first computer matrix analysis of nucleic acids using TRAC, which Brenner continues to use. Crick, Brenner, Klug and Pieczenik returned to their early work on deciphering the genetic code with a pioneering paper on the origin of protein synthesis, where constraints on mRNA and tRNA co-evolved allowing for a five-base interaction with a flip of the anticodon loop, and thereby creating a triplet code translating system without requiring a ribosome. This model requires a partially overlapping code. The published scientific paper is extremely rare in that its collaborators include three authors who independently became Nobel laureates. Brenner founded the Molecular Sciences Institute in Berkeley, California in 1996. As of 2015[update] he was associated with the Salk Institute, the Institute of Molecular and Cell Biology, the Singapore Biomedical Research Council, the Janelia Farm Research Campus, and the Howard Hughes Medical Institute. In August 2005, Brenner was appointed president of the Okinawa Institute of Science and Technology. He was also on the Board of Scientific Governors at The Scripps Research Institute, as well as being Professor of Genetics there. A scientific biography of Brenner was written by Errol Friedberg in the US, for publication by Cold Spring Harbor Laboratory Press in 2010. Known for his penetrating scientific insight and acerbic wit, Brenner, for many years, authored a regular column ("Loose Ends") in the journal Current Biology. This column was so popular that "Loose ends from Current Biology", a compilation, was published by Current Biology Ltd. and became a collectors' item. Brenner wrote "A Life In Science", a paperback published by BioMed Central. Brenner is also noted for his generosity with ideas and the great number of students and colleagues his ideas have stimulated. In 2017, Brenner co-organized a seminal lecture series in Singapore describing ten logarithmic scales of time from the Big Bang to the present, spanning the appearance of multicellular life forms, the evolution of humans, and the emergence of language, culture and technology. Prominent scientists and thinkers, including W. Brian Arthur, Svante Pääbo, Helga Nowotny and Jack Szostak, spoke during the lecture series. In 2018, the lectures were adapted into a popular science book titled Sydney Brenner’s 10-on-10: The Chronicles of Evolution, published by Wildtype Books. Brenner also gave four lectures on the history of Molecular Biology, its impact on Neuroscience and the great scientific questions that lie ahead. The lectures were adapted into the book, In the Spirit of Science: Lectures by Sydney Brenner on DNA, Worms and Brains. The "American plan" and "European Plan" were proposed by Sydney Brenner as competing models for the way brain cells determine their neural functions. According to the European plan (sometimes referred to as the British plan), the function of cells is determined by its genetic lineage. According to the American plan, a cell's function is determined by the function of its neighbours after cell migration. Further research has shown that most species follow some combination of these methods, albeit in varying degrees, to transfer information to new cells. In recognition of his pioneering role in starting what is now a global research community that work on C. elegans, another closely related nematode was given the scientific name Caenorhabditis brenneri. The National Science and Technology Medal by the Agency for Science, Technology and Research awarded Brenner in 2006 for his distinguished and strategic contributions to the development of Singapore’s scientific capability and culture, particularly in the biomedical sciences sector. Brenner was married to May Brenner (née Covitz, subsequently Balkind) from December 1952 until her death in January 2010; their children include Belinda, Carla, Stefan, and his stepson Jonathan Balkind from his wife's first marriage to Marcus Balkind. He lived in Ely, Cambridgeshire. He was an atheist. Brenner died on 5 April 2019, in Singapore, at the age of 92. ^ a b c Friedberg, Errol (2019). "Sydney Brenner (1927-2019) Mischievous steward of molecular biology's golden age". Nature. 568 (7753): 459–459. doi:10.1038/d41586-019-01192-9. ISSN 0028-0836. PMID 30988427. ^ a b Brenner, Sydney (1974). "The genetics of Caenorhabditis elegans". Genetics. 77 (1): 71–94. PMC 1213120. PMID 4366476. ^ Sulston, J.; Brenner, S. (1974). "The DNA of Caenorhabditis elegans". Genetics. 77 (1): 95–104. PMC 1213121. PMID 4858229. ^ a b "Sydney Brenner EMBO profile". people.embo.org. Heidelberg: European Molecular Biology Organization. ^ a b "Sydney Brenner PhD". scripps.edu. Archived from the original on 2 February 2012. ^ a b c "Janelia Farm: Sydney Brenner". hhmi.org. Archived from the original on 27 December 2007. ^ "Research Units | Okinawa Institute of Science and Technology Graduate University OIST". Oist.jp. 1 February 2016. Retrieved 1 December 2016. ^ Thompson, H. (1973). "Cyril Norman Hinshelwood 1897-1967". Biographical Memoirs of Fellows of the Royal Society. 19: 374–431. doi:10.1098/rsbm.1973.0015. ^ a b Brenner, Syndney (1954). The physical chemistry of cell processes: a study of bacteriophage resistance in Escherichia coli, strain B (DPhil thesis). University of Oxford. OCLC 775695643. EThOS uk.bl.ethos.672365. ^ Rubin, Gerald Mayer (1974). Studies on 5.8 S Ribosomal RNA (PhD thesis). University of Cambridge. OCLC 500553465. EThOS uk.bl.ethos.471132. ^ White, John Graham (1974). Computer Aided Reconstruction of the Nervous System of Caenorhabditis Elegans (PhD thesis). University of Cambridge. OCLC 180702071. EThOS uk.bl.ethos.477040. ^ Elizabeth Dzeng (2014). "How Academia and Publishing are Destroying Scientific Innovation: A Conversation with Sydney Brenner". kingsreview.co.uk. Archived from the original on 5 February 2015. ^ Wade, Nicholas (5 April 2019). "Sydney Brenner, a Decipherer of the Genetic Code, Is Dead at 92". The New York Times. ^ Hodgkin, JA; Brenner, S (1977). "Mutations causing transformation of sexual phenotype in the nematode Caenorhabditis elegans". Genetics. 86 (2 Pt. 1): 275–87. ISSN 0016-6731. PMC 1213677. PMID 560330. ^ Horace Freeland Judson The Eighth Day of Creation (1979), pp. 10–11 Makers of the Revolution in Biology; Penguin Books 1995, first published by Jonathan Cape, 1977; ISBN 0-14-017800-7. ^ Brenner, S.; Elgar, G.; Sanford, R.; Macrae, A.; Venkatesh, B.; Aparicio, S. (1993). "Characterization of the pufferfish (Fugu) genome as a compact model vertebrate genome". Nature. 366 (6452): 265–68. Bibcode:1993Natur.366..265B. doi:10.1038/366265a0. ISSN 0028-0836. PMID 8232585. ^ a b "Sydney Brenner: A Biography" by Errol Friedberg, pub. CSHL Press October 2010, ISBN 0-87969-947-7. ^ de Chadarevian, Soraya (2009). "Interview with Sydney Brenner". Studies in History and Philosophy of Science Part C: Studies in History and Philosophy of Biological and Biomedical Sciences. 40 (1): 65–71. doi:10.1016/j.shpsc.2008.12.008. ISSN 1369-8486. PMID 19268875. ^ Friedberg, Errol C. (2008). "Sydney Brenner". Nature Reviews Molecular Cell Biology. 9 (1): 8–9. doi:10.1038/nrm2320. ISSN 1471-0072. PMID 18159633. ^ "Sydney Brenner publications". Google Scholar. Retrieved 28 September 2008. ^ "Errol C. Friedberg. Sydney Brenner: A Biography" (PDF). cshlpress.com. ^ a b "Sydney Brenner, Biographical". nobelprize.org. Retrieved 6 April 2019. ^ "Brenner, Sydney (1927– ) World of Microbiology and Immunology". encyclopedia.com. Retrieved 27 July 2016. ^ "Dr Sydney Brenner". Exeter College. Retrieved 6 April 2019. ^ "Sydney Brenner: Senior Distinguished Fellow of the Crick-Jacobs Center". Salk Institute. This book is all about the MRC Laboratory of Molecular Biology, Cambridge. ^ Volkin, Elliot; Astrachan, L. (1956). "Phosphorus incorporation in Escherichia coli ribonucleic acid after infection with bacteriophage T2". Virology. 2 (2): 149–161. doi:10.1016/0042-6822(56)90016-2. ISSN 0042-6822. ^ Kaplish, L. (19 February 2014). "Uncovering a scientific life in the archives". Wellcome Library blog. Retrieved 5 April 2019. ^ Lloyd-Evans, L. P. M. (January 2005). A Study into the Prospects for Marine Biotechnology Development in the United Kingdom (PDF) (Report). Volume 2 – Background & Appendices. Foresight Marine Panel Marine Biotechnology Group. p. 237. Retrieved 5 April 2019. ^ "Letter by Brenner (primary source)" (PDF). rutgers.edu. ^ Crick, FH; Brenner, S; Klug, A; Pieczenik, G (December 1976). "A speculation on the origin of protein synthesis". Origins of Life. 7 (4): 389–97. Bibcode:1976OrLi....7..389C. doi:10.1007/BF00927934. PMID 1023138. Retrieved 8 March 2018. ^ Crick won a Nobel prize in 1962, Brenner in 2002, and Klug in 1982. However, this is not the only case. See Barton, D. H. R.; Jeger, O.; Prelog, V.; Woodward, R. B. (March 1954). "The constitutions of cevine and some related alkaloids". Experientia. 10 (3): 81–90. doi:10.1007/BF02158513. PMID 13161888. Barton (1969), Prelog (1975) and Woodward (1965) all became Nobel winners. ^ Sydney Brenner (8 December 2002). "Nobel Lecture: Nature's Gift to Science" (video & pdf). nobelprize.org. Retrieved 28 September 2008. ^ Brenner, Sydney (1 June 2009). "In the Beginning Was the Worm …". Genetics. 182 (2): 413–415. doi:10.1534/genetics.109.104976. ISSN 0016-6731. PMC 2691750. PMID 19506024. ^ "Dr. Sydney Brenner | Okinawa Institute of Science and Technology Graduate University OIST". Oist.jp. 12 January 2010. Archived from the original on 18 December 2015. Retrieved 1 December 2016. ^ Profile, Scripps.edu; accessed 28 July 2016. ^ "Library: Sydney Brenner's Loose Ends". cell.com. ^ Brenner, Sydney (1994). "Loose Ends". Current Biology. 4 (1): 88. doi:10.1016/S0960-9822(00)00023-3. ISSN 0960-9822. ^ Brenner, Sydney. "Coming from Eastern European stock" – via www.webofstories.com. ^ "Sydney Brenner interviewed by Alan Macfarlane, 2007-08-23 (film)". alanmacfarlane.com. ^ "Genomes Tell Us About the Past: Sydney Brenner". iBiology.org. 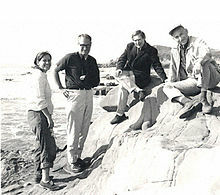 ^ "The Sydney Brenner papers". Wellcome Library. 25 October 2016. Retrieved 1 December 2016. ^ "10-on-10: The Chronicles of Evolution". ^ Sydney Brenner's 10-on-10: The Chronicles of Evolution. Wildtype Books. 9 November 2018. ISBN 978-9811187186. ^ Brenner, Sydney; Sejnowski, Terrence (2018). In the Spirit of Science: Lectures by Sydney Brenner on DNA, Worms and Brains. World Scientific Publishing Co. doi:10.1142/11029. ISBN 978-981-3271-73-9. ^ Gilbert, S.F. (2000). "The Developmental Mechanics of Cell Specification". Developmental Biology. Sunderland (MA): Sinauer Associates. ISBN 978-0-87893-243-6. ^ McKay, R. (1997). "The Origins of the Central Nervous System". Isolation, Characterization and Utilization of CNS Stem Cells. Berlin Heidelberg: Springer-Verlag. pp. 169–170. ^ Marcus, Gary Fred (2004). The Birth of the Mind: How a Tiny Number of Genes Creates the Complexities of Human Thought. Basic Books. p. 64. ISBN 9780465044054. ^ Rensberger, Boyce (1998). Life Itself: Exploring the Realm of the Living Cell. Oxford University Press. p. 162. ISBN 9780195125009. ^ "Sydney Brenner CV" (PDF). ETH Zurich. Retrieved 6 April 2019. ^ "Sydney Brenner Curriculum Vitae". NobelPrize.org. Retrieved 6 April 2019. ^ "All Gairdner Winners". The Canada Gairdner Awards. Retrieved 5 April 2019. ^ "2002 Nobel Prize". nobelprize.org. Retrieved 28 September 2008. ^ "Dan David Prize laureate 2002: Sydney Brenner". dandavidprize.org. Archived from the original on 23 July 2011. Retrieved 28 September 2008. ^ Sudhausi, Walter; Kiontke, Karin (25 April 2007). "Comparison of the cryptic nematode species Caenorhabditis brenneri sp. n" (PDF). Zootaxa. 1456: 45–62. doi:10.11646/zootaxa.1456.1.2. Retrieved 28 September 2008. ^ "Sydney Brenner Institute for Molecular Bioscience". University of the Witwatersrand. Retrieved 28 September 2008. ^ István Hargittai; Magdolna Hargittai (2006). Candid Science VI: More Conversations with Famous Scientists. p. 32. ISBN 9781908977533. ^ Shuzhen, Sim (5 April 2019). "Sydney Brenner, 'father of the worm' and decoder of DNA, dies at 92". asianscientist.com. Retrieved 5 April 2019. ^ "Sydney Brenner (1927–2019)". MRC Laboratory of Molecular Biology. 5 April 2019. Retrieved 6 April 2019. Georgina Ferry; 'Max Perutz and the Secret of Life', (Chatto & Windus 2007) 352pp, ISBN 978-0-7011-7695-2. For uncaptioned picture. Robert Olby; Francis Crick: Hunter of Life's Secrets, Cold Spring Harbor Laboratory Press, ISBN 978-0-87969-798-3, published on 25 August 2009. Max Perutz; What a Time I am Having: Selected Letters., CSHL Press 2008, 506pp ISBN 978-0-87969-864-5. For captioned picture.